Braids are a popular, practical style for natural curlies when they are transitioning, growing out a cut, or simply giving their hair a break from manipulation. 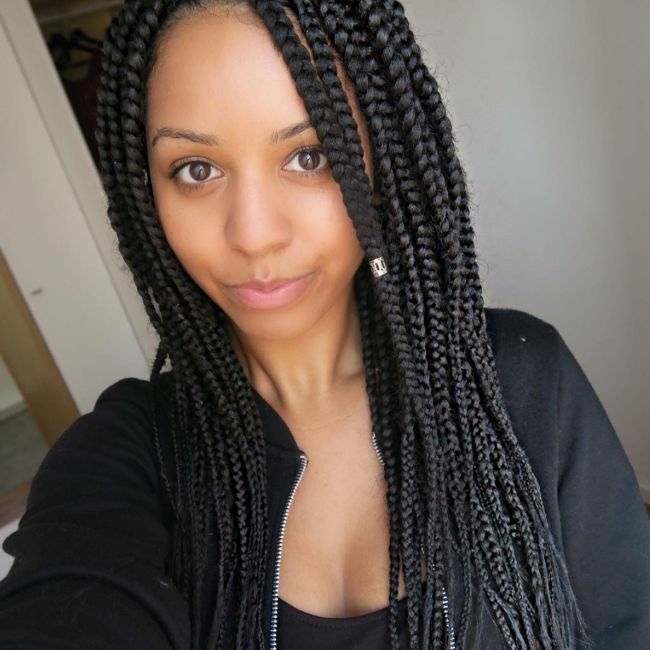 Braids (and twists) look beautiful and you can get creative with lengths, thickness, and color and all without damaging the hair -- but only if you are careful! You may be annoyed that your time with them is up; I know I was. However, you must put that energy into taking them out correctly in order to cause less stress to your scalp and hair. My keywords for this process: time and slip. You must set aside enough time for this process just as you did for installing the braids in the first place; the worst thing to do is to rush, as you may cause damage in doing so. Add a slippery detangling product to the hair that makes it easy to glide through its surface -- this is the best way to remove knots or any tight style from the hair. You must set aside enough time for this process just as you did for installing the braids in the first place; the worst thing to do is to rush, as you may cause damage in doing so. Spritz the braids with some warm water. Then follow up with your chosen product with slip; carefully making sure you cover all parts of the hair. Begin from the bottom upwards. If your braids are much longer than your natural hair you can cheat by cutting the bottoms, but still leave enough space to where your natural hair ends, keeping in mind your natural hair is now stretch and has probably grown. Simply trim the ends and use a comb to unravel the first few sections of the braid. Apply more detangler to your fingertips and slowly unravel the braids/twist. Once you have unravelled the braid/twist to the root you will be able to slowly remove the extensions takes breath it will feel amazing! Do not be alarmed if you see huge knots at the ends or some breakage. We shed hair daily so the weeks (or months) worth of hair in our braids will equate to a decent amount of hair fall. Once the protective style is removed you want to treat your hair like a newborn baby -- give it lots of TLC. Clarify as if your scalp has been working overtime! Deep condition with heat to get your best conditioning treatment out the cupboard and sit under a cap/hooded dryer for a good 30/40 minutes, your hair will thank you for it. I like Mielle Organics Babassu Oil & Mint Deep Conditioner and SheaMoisture Superfruit Complex 10-in-1 Hair Masque. Once you've followed this process, allow your hair to breathe! Do a simple wash and go -- no crazy manipulation -- you want to let your hair be in its natural state and relax for the next week or so. You should find your natural hair back in great condition after being tucked away for so long! Devri shares her protective style take-down: before, during and after. For more inspiration, follow us on Instagram @NaturallyCurly and follow me on Instagram @UKCurlyGirl.